It's a well-worn, but generally true, adage that the better someone was at a sport, the worse of an instructor they will make. That is true of many sports and is certainly the case when it comes to hitting a baseball. I believe the reason why that adage holds for baseball hitting is related to the speed the ball moves and how little time the hitter has to read the pitch and react. As a result, hitting is incredibly intuitive. Thinking will only create problems. With very few exceptions, the best hitters tend to have very little conscious understanding of what they do. The really important work is done by the unconscious, largely inaccessible parts of the brain that are responsible for motor learning. Consequently, when they are asked to explain what they do when they swing the bat, they are literally at a loss for words. They have to fall back on what they were taught about hitting, regardless of whether what they were taught bears any resemblance to what they actually did. You can see this disconnect between what good hitters actually did, and what they say and perhaps think they did, in the words of people like Don Mattingly, Tony Gwinn, and Mark McGwire. While in his presentations on hitting Tony Gwynn rails against a flaw he calls a "chicken wing" and how it creates a loop in the path of the barrel, in the clip below you can see Tony Gwynn chicken wing and looping the barrel below the ball. In truth, a chicken wing and a loop in the swing aren't bad things. Instead, they are how good hitters hit the ball with a slight uppercut and, as Ted Williams said, match the plane of the swing to the plane of the pitch. Don Mattingly is perhaps the most prominent voice when it comes to hitting instruction. His thoughts about hitting have influenced countless people and organizations. 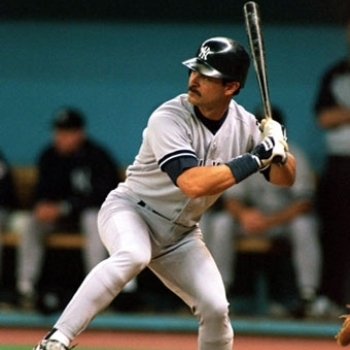 The problem is that, as I discuss in my piece on The Myth of the A to C Swing, if you compare what Don Mattingly teaches about hitting, and what he actually did, you will see some very large differences. Don Mattingly advocates a direct, linear hand path, keeping the barrel above the ball, and the level swing. However, if you look at the clips above you will see a standard rotational hand path. You will also see the bat head drop below his hands as he hits the ball with an uppercut (and a very pronounced uppercut in the second clip). 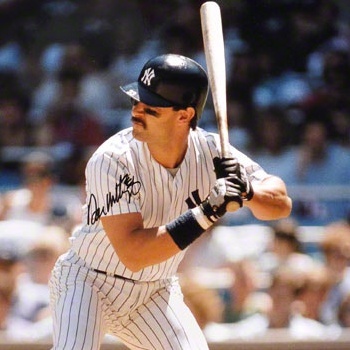 Don Mattingly is also perhaps the biggest proponent of lining up the door knocker knuckles when you grip the bat, but he didn't actually do that himself. A similar disconnect exists between what Mark McGwire has been reported to have said about hitting and what he actually did when he was playing. I haven't found a piece where McGwire directly expresses his hitting philosophy, but I have found this piece where his approach to hitting is described. The Cardinals hitters are learning McGwire’s philosophy to take the shortest path to the baseball with their hands before hitting through the ball and eliminating the loops in their swings and other extraneous movements. Hitting through the ball creates backspin, which allows the ball to carry…Radar was the first to convince McGwire that less movement meant less room for error. That’s when McGwire tamed his leg kick and lowered his arms and started taking a straight-line approach to the ball. As further evidence of what Mark McGwire teaches, there's what Brendan Ryan had to say in early 2010 about his understanding of hitting mechanics. What you see at 1:36 of the video clip that I link to above is very standard, but is also utter nonsense. There is very little resemblance between what Brendan Ryan demonstrates in the clip and what good hitters actually do. If you look at Mark McGwire's swing, you will see a standard high-level swing, with no short, direct, linear hand path and lots of (necessary loading) movement before the start of the swing. Mark McGwire didn't keep the barrel above the ball through the point of contact. Mark McGwire had a loop in every one of his swings, because a slight uppercut is necessary to get the ball up into the air. Mark McGwire also shows no sign of the direct, linear hand path that he teaches in any of the clips above. Instead, his hands are connected to, and rotate with, his back shoulder. Albert Pujols recently had a conversation with Harold Reynolds about hitting on the MLB Network. What's interesting about this conversation is that it's good evidence for the gap between the conscious, thinking mind and the subconscious, doing mind. What Albert Pujols tells you NOT to do is what he actually does in his swing and what he tells you TO do isn't what he actually does. Instead, it's the same older linear hitting garbage -- perhaps gained from conversations with Mark McGwire -- that most major league instructors preach but that no good hitters actually do. The bottom line is that Don Mattingly, Tony Gwynn, Mark McGwire, and Albert Pujols don't teach the swing that they used. Some of that is because the feel of a swing can differ from the reality of the swing, and it can be hard to understand the reality of the swing without looking at video. This can also be due to the fact that the betters are extremely intuitive and the more they think, the worse they hit. Regardless of why this happens, the fact is that good hitters can often make terrible hitting instructors because of the wide gulf between what they actually did, what they think they did, and what they teach.